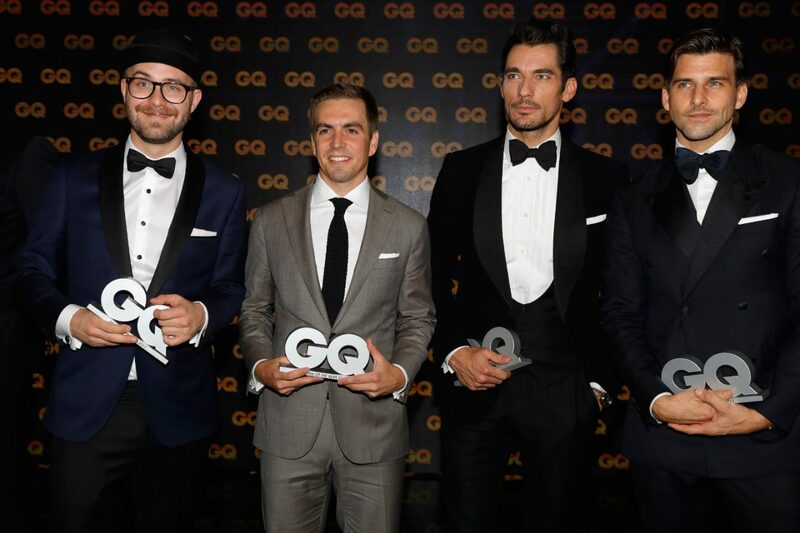 Condé Nast’s German edition of GQ handed out its Men of the Year Awards at the Komische Oper in Berlin last night, with David Gandy, Philipp Lahm, Thom Browne, and the film Willkommen bei den Hartmanns among those honoured. Showing that GQ Deutschland put his infidelity behind him, actor and former California governor Arnold Schwarzenegger was awarded Legend of the Century, presented by his son Patrick and by GQ Deutschland editor-in-chief Tom Junkersdorf. Gandy was 2017’s Style Icon, Lahm the Sports Icon, Browne won for Designer of the Year, while Willkommen bei den Hartmanns (Welcome to Germany), which dealt with the topic of refugees, took home a Special Achievement award. Accepting on behalf of the film were Eric Kabongo, Elyas M’Barek, Palina Rojinski, Simon Verhoeven, and Quirin Berg. Other honorees were Johannes Huebl (Influencer of the Year), Matthias Schweighöfer (Actor of the Year), Mark Forster (Musician of the Year—National), Gregory Porter (Musician of the Year—International), and the film Fack Ju Göhte (Movie of the Year). Elyas M’Barek came up to accept for a second time for Fack Ju Göhte with Max von der Groeben, Jella Haase, Barbara Schöneberger and Gizem Emre. Other presenters on the night were actress Nilam Farooq, GQ Deutschland publisher André Pollmann, Jessica Schwarz, Clemens Schick, Vogue Deutschland editor-in-chief Christiane Arp, and Janin Ullmann. Among the 850 VIPs at the event were Condé Nast publisher Moritz von Laffert, Franziska Knuppe, Cathy Hummels, Tom Wlaschiha, Natalia Avelon, Eva Padberg, Sami Slimani and his sisters Lamiya and Dounia, Ingo Wilts, Moritz von Laffert, Rebecca Mir and Massimo Sinato, Motsi Mabuse, Nazan Eckes, Till Brönner, Frank Briegmann, Kara Hecker, Kostja Ullmann, Heather Milligan, Til Schweiger and his daughter Luna Schweiger, Stefanie Giesinger, Ralph Hasenhuettl, Diego Demme, Bernardo Fernandes da Silva Junior, Federico Palacios Martínez, Oliver Mintzlaff, Florian Scholz, Luise Befort, Thore Schölermann and Jana Julie Kilka, Mousse T, Eva Padberg, Motsi Mabuse, Nova Meierhenrich, Simon Webbe and Lee Ryan of Blue, and Toni Mahfud.